Anacortes, WA – August 2018 – Productive Dentist Academy (PDA) is being honored with a spot on the Inc. 5000 list of Fastest-Growing Private Companies in 2018. The 2018 listing celebrates PDA’s position as #71 in the Education Industry category and #84 our of all Washington State businesses who made the list in 2018. This marks the 4th time Productive Dentist Academy has earned a place on the Inc. 5000 list, a feat only achieved by 17% of companies that make the list. PDA was previously honored in 2012, 2013, and 2014. Recognition as an Inc. 5000 company shows impressive percentages of revenue growth over a three-year period. 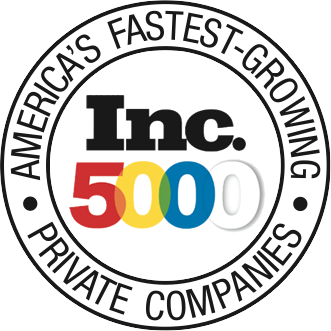 Since 1982, the Inc. 5000 list has recognized the fastest-growing companies in the United States and only includes brands that have proven themselves with increased growth, revenue, and reputation within their respective industries. For companies seeking to rise as private business and business leaders, receiving recognition on the Inc. 5000 list is one of the most coveted honors. The list represents a unique look at the most successful companies within the American economy’s most dynamic segment – independent small businesses. Microsoft, Dell, Domino’s Pizza, Pandora, Timberland, LinkedIn, Yelp, Zillow, and many other well-known names gained their first national exposure as honorees on the Inc. 5000 list. Since 2004, Productive Dentist Academy has helped thousands of dentists across the nation increase productivity by equipping them with strategies to improve treatment planning, scheduling, and communication skills. Productivity Workshops– Our AGD-accredited Productivity Workshops are the nation’s leading dental Continuing Education courses in Business Management for dentists. Additional Events – In addition to the Productivity Workshops, PDA hosts the BlueSky leadership and annual planning event, as well as fully-immersive Over-the-Shoulder events where dentists and their teams get in-office insight with PDA Co-Founder Dr. Bruce B. Baird on how to be more effective clinically and build better patient and team relationships. Business Coaching – Nationally known for our custom business plans that focus on the core six areas of dental practices – people, profits, promotion, projections, practice types, and productive departments – PDA coaching helps practices create, optimize, and most importantly implement systems that work. Marketing – PDA understands what it takes to grow a dental practice, connect with local communities, and secure an office’s future. Custom-tailored brand and marketing solutions use strategies that get results and attract high-quality patients. PDA ǀ Marketing Group was recognized in 2013 with the bronze Stevie Award, one of the world’s premier business awards, for custom web design. Marketing Coaching – For dentists who want to dominate their market, PDA Marketing Coaches manage all aspects of an office’s marketing needs and dive deeper into demographics, local community needs, and specific practice needs and goals to produce comprehensive plans supported by highly-detailed ROI tracking. With a home office in Anacortes, WA and coaches located throughout the country, Productive Dentist Academy has been in operation since 2004. Through dental practice business consulting, continuing education, and full-service marketing, PDA has helped thousands of dentists across the United States build better practices and take better care of their patients. We work with General Dentists and Specialists from scratch-start practices, to mid-career slumps, to retirement options, to expansion and multi-practice owners to develop custom business development plans, while increasing productivity and decreasing stress. For more information on Productive Dentist Academy, call (360) 709-7765 or visit www.productivedentist.com.